Advancement in the light of pioneering and ground-breaking research work has created a scenario wherein the ophthalmologist today is capable of offering far greater precision and predictability to the patient. However, we remain plagued with inadequacies while dealing with some participants; participants that continue to be the cause of significant morbidity. Age-related macular degeneration (AMD) is one of such spheres, where lack of conclusiveness in our understanding of the pathogenesis and treatment options renders us in a spot of uneasiness. AMD is characterized by progressive degeneration of retinal pigment epithelial (RPE) complex/photoreceptors primarily in the macular region of the retina affecting elderly population. The prevalence of AMD was 3.4% (prevalence of early and late AMD was 2.0% and 1.4%, respectively) as per the India Eye Study. The conventional classification divides AMD into two forms as follows: (1) dry or nonneovascular AMD and (2) wet or neovascular AMD. Dry AMD is characterized by the death of cells in the macula, geographic atrophy, and wet AMD is characterized by choroidal neovascularization and/or RPE detachment. Increasing age is the most important risk factor for AMD. There are very few studies that document the association of AMD with modifiable risk factors. Our study aims to analyze the correlation between AMD and body mass index (BMI) and waist circumference (WC) and smoking. The study was conducted after obtaining approval from the institutional ethics committee and the scientific research committee. It was a hospital-based, observational, case–control study. Hundred patients presenting to our outpatient department over a period of 1 year were included in the study. Inclusion criteria consisted of age more than 40 years and the presence of AMD. The selected participants were grouped into the AMD group which included 50 eyes with either nonneovascular or neovascular AMD and 50 eyes in control group. Patients with coexisting retinal pathology, media opacities, any systemic inflammatory disease, and known renal disease were excluded from the study. Recruitment of patients was done after a comprehensive ophthalmologic evaluation by an experienced ophthalmologist. The diagnosis was made after slit-lamp biomicroscopic examination with + 90 Diopter (D) lens, indirect ophthalmoscopy with + 20 D lens, fundus fluorescein angiography, and indocyanine green angiography. A detailed systemic examination was done in all the cases including a general physical examination and body weight in kilogram (kg) and height in meter (m) and WC in centimeter (cm). BMI was calculated using the formula weight (kg)/height2 (m2). Collected data were subjected to a master tabulation in Microsoft Excel 2010 spreadsheet according to the study protocol. Statistical analyses were performed with SPSS version 21.0 (SPSS, Chicago, IL). was used for statistical analysis. P < 0.05 was considered to be statistically significant. Data were analyzed using the Kruskal–Wallis test and Anderson–Darling and Kolmogorov–Smirnov (ANOVA) test. The mean age was 66 years (49–85 years). Of 100 participants, 61 were male and 39 were female. The mean age in the AMD group was 67.26 ± 7.96 years (49–83 years) and mean age in the control group was 65.4 ± 7.86 (50–85 years) [Figure 1]. There was no significant difference between the case and control group with respect to the age (P = 0.2426 and t = 1.176 at 95% confidence interval and 98 DF). 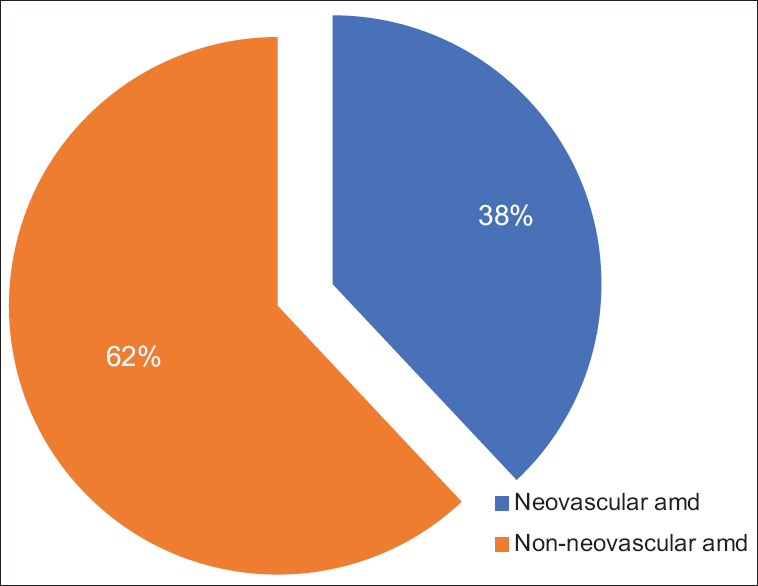 In the AMD group, nonneovascular AMD was seen in 31 eyes (62%) whereas neovascular AMD was observed in 19 eyes (38%) [Figure 2]. 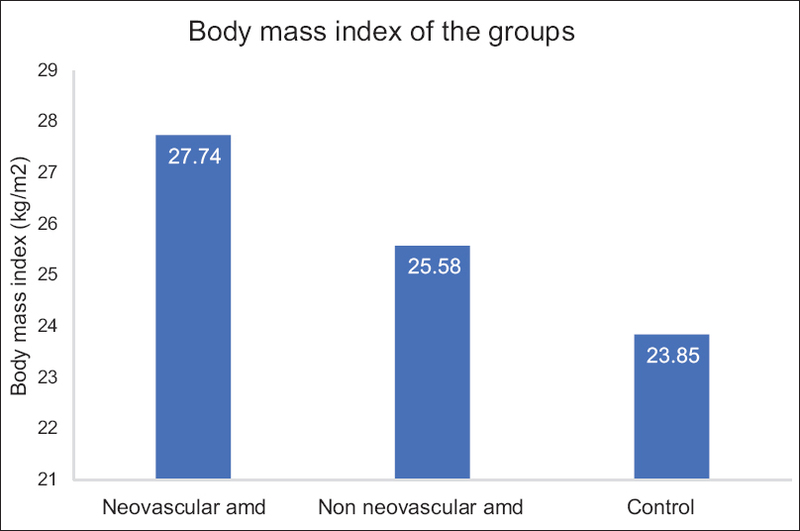 The mean BMI in neovascular AMD cases was 27.74 ± 4.93 kg/m2 (n = 19) and the mean BMI in nonneovascular AMD cases was 25.58 ± 2.90 kg/m2 (n = 31), whereas mean BMI in control group was 23.85 ± 3.31 kg/m2 (n = 50) [Figure 3]. There was a statistically significant difference between the control group and the two AMD groups separately (ANOVA; F = 8.605; DF = 2; P < 0.001). Linear regression analysis showed that a unit increase in BMI leads to 4.282 times increased chance of having AMD which was statistically significant (P< 0.001). 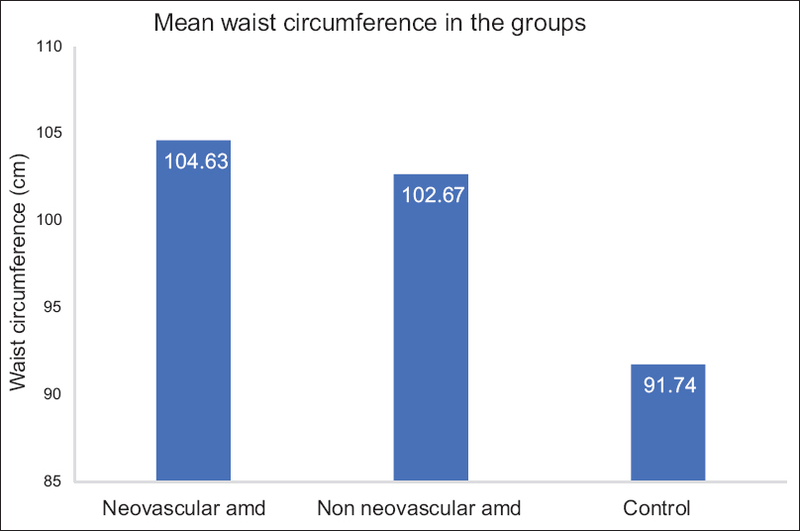 The mean WC in the neovascular AMD cases was 104.6 ± 5.7 cm (n = 19), nonneovascular AMD cases was 102.6 ± 6.1 cm (n = 31), and in the control group was 91.7 ± 6.7 cm (n = 50) [Figure 4]. There was a statistically significant difference between the control group and the two AMD groups separately (ANOVA; F = 42.70; DF = 2; P < 0.001). Linear regression analysis showed that a unit increase in WC leads to 7.942 times increased chance of having AMD which was statistically significant (P< 0.001). Linear regression analysis showed that smokers had a 1.78 times increased risk of having AMD which was statistically significant (P< 0.001). Due to increase in life expectancy of population along with a reduction in avoidable blindness due to the anterior segment abnormalities, the global burden of AMD is likely to double by 2020 to 6 million. Hence, it has occupied an important place in the World Health Organization action plan to reduce the global burden of avoidable blindness by 2020. This study aims to establish an association between modifiable risk factors and AMD. 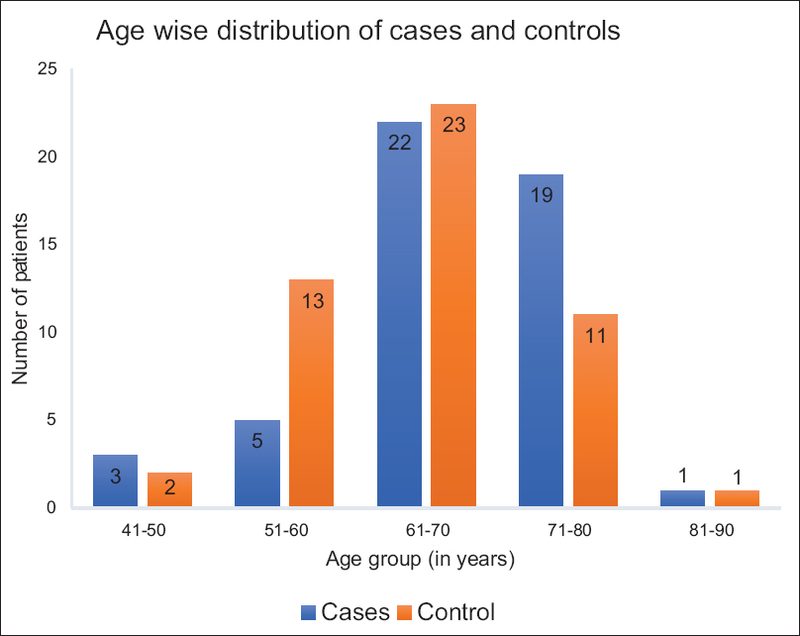 The mean age of patients in AMD and control group in the present study was 67.26 ± 7.96 years and 65.6 ± 7.86 years, respectively. Subramani et al. reported similar findings in their study, that is, the mean age in the AMD and control group was 68.75 ± 9.23 years and 64.61 ± 9.24 years, respectively. In a study by Moeini et al., the mean age of the participants was 69.9 years. In a study by Schaumberg et al., patients with AMD were within the age group of 40–84 years. In the present study, it was found that the mean BMI in patients with AMD was 26.40 kg/m2 and in the control group was 23.85 kg/m2. After statistical analysis, it was observed that BMI in patients with AMD was significantly higher (P< 0.001) than the control group. Linear regression analysis of BMI among the three groups showed that a unit increase in BMI increases the risk of AMD by 4.28 times. In a study by Seddon et al., based on a multivariate model in relation to obesity measures and other variables on the risk of progression of AMD, they observed that higher levels of BMI were associated with increased risk of AMD progression which was statistically significant (P = 0.07). It was observed that in patients having BMI in range of 25–29, the relative risk of AMD was 2.32 and for patients with BMI ≥30, the relative risk of AMD was 2.35. In age-related eye disease study (AREDS), it was found that higher BMI was associated with the development of neovascular AMD. In a study by Hirvelä et al., the investigators proposed that excessive caloric intake increases the risk of oxidative damage which leads to the development of AMD. In the present study, it was observed that the WC varied significantly in AMD and control groups (P< 0.001). On linear regression analysis of WC as a risk factor for developing AMD, it was demonstrated that patients with larger WC had a 7.94 times higher likelihood of having AMD as compared to control group. In a study by Seddon et al., it was found that higher WC leads to two-fold increase the risk of progression of AMD (P = 0.02). A study by Adams et al. showed that the odds of developing early AMD was 0.9 (P = 0.7) and late AMD was 1.83 (P = 0.02). Similar to BMI, WC has been also considered as an informative measure of obesity. WC describes various patterns of abdominal adiposity which has a different metabolic consideration as compared to patterns of overall fat distribution. WC is a significant factor in predicting the occurrence of metabolic syndrome which in turn predisposes to vascular stress and AMD. As an indicator of overall mortality and coronary heart disease, WC has gained importance in the current scenario. However, no study in the literature so far has demonstrated a correlation between the WC and AMD. In the present study, we observed that there was a significant association between smoking and the occurrence of AMD (P< 0.001). On linear regression analysis, we observed that smokers had 1.17 times increased the risk of developing AMD as compared to the nonsmokers. The AREDS study demonstrated that the risk of developing geographic atrophy was 1.61 times and that of neovascular AMD was 1.91 times higher among the smokers. In a study by Chakravarthy et al. for comparing the risk of developing AMD among smokers and nonsmokers, they found that the smokers had a 5 times higher risk of developing geographic and a 2.5 times higher risk of developing neovascular AMD as compared to nonsmokers. Smoking leads to a decrease in the level of circulating antioxidants and thereby increasing the free radical-mediated cytotoxicity. This hypothesis is consistent with findings of the study by Stryker et al., who reported that, after adjustment of the dietary differences, the smokers had only 72% of plasma β-carotene levels as compared to the nonsmokers. Smoking could also cause hypoxic changes by reducing the circulating oxygen levels and increasing the levels of carbon monoxide, thus promoting atherosclerosis which in turn damages the choroidal vessels. There are a few limitations of this study. Since the present study does not categorize the patients according to the stage of AMD (early and late), the effects of the risk factors on the progression of the disease could not be established clearly. As the patients were not followed, the change in the progression of the disease as a result of alteration in the modifiable risk factors could not be ascertained. A prospective cohort study design would have given a more conclusive result in regard to the above associations. A statistically significant correlation exists between BMI, WC, smoking, and severity of AMD. As is evident from the findings of this study, patients presenting with a higher BMI and WC will benefit from regular screening to detect early changes associated with AMD thereby helping to prevent severe vision loss associated with the pathology. Community-based awareness should be generated regarding the modifiable risk factors for prevention of AMD. Ratnapriya R, Chew EY. Age-related macular degeneration-clinical review and genetics update. Clin Genet 2013;84:160-6. Gupta SK, Murthy GV, Morrison N, Price GM, Dherani M, John N, et al. Prevalence of early and late age-related macular degeneration in a rural population in Northern India: The INDEYE feasibility study. Invest Ophthalmol Vis Sci 2007;48:1007-11. 2018. Available from: http://www.who.int/blindness/Vision2020_report.pdf. [Last accessed on 2018 Aug 09]. Subramani S, Khor SE, Livingstone BI, Kulkarni UV. Serum uric acid levels and its association with age-related macular degeneration (ARMD). Med J Malaysia 2010;65:36-40. Moeini HA, Masoudpour H, Ghanbari H. A study of the relation between body mass index and the incidence of age related macular degeneration. Br J Ophthalmol 2005;89:964-6. Schaumberg DA, Christen WG, Hankinson SE, Glynn RJ. Body mass index and the incidence of visually significant age-related maculopathy in men. Arch Ophthalmol 2001;119:1259-65. Seddon JM, Cote J, Davis N, Rosner B. Progression of age-related macular degeneration: Association with body mass index, waist circumference, and waist-hip ratio. Arch Ophthalmol 2003;121:785-92. Age-Related Eye Disease Study Research Group. Risk factors associated with age-related macular degeneration. A case-control study in the age-related eye disease study: Age-related eye disease study report number 3. Ophthalmology 2000;107:2224-32. Hirvelä H, Luukinen H, Läärä E, Sc L, Laatikainen L. Risk factors of age-related maculopathy in a population 70 years of age or older. Ophthalmology 1996;103:871-7. Adams MK, Simpson JA, Aung KZ, Makeyeva GA, Giles GG, English DR, et al. Abdominal obesity and age-related macular degeneration. Am J Epidemiol 2011;173:1246-55. Baik I, Ascherio A, Rimm EB, Giovannucci E, Spiegelman D, Stampfer MJ, et al. Adiposity and mortality in men. Am J Epidemiol 2000;152:264-71. Chakravarthy U, Augood C, Bentham GC, de Jong PT, Rahu M, Seland J, et al. Cigarette smoking and age-related macular degeneration in the EUREYE study. Ophthalmology 2007;114:1157-63. Stryker WS, Kaplan LA, Stein EA, Stampfer MJ, Sober A, Willett WC, et al. The relation of diet, cigarette smoking, and alcohol consumption to plasma beta-carotene and alpha-tocopherol levels. Am J Epidemiol 1988;127:283-96.